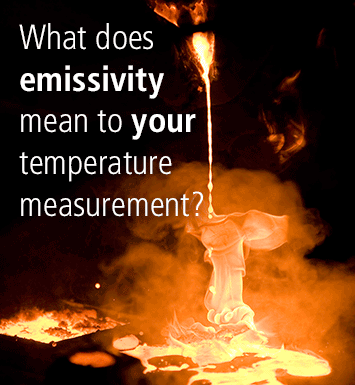 Determine true temperature with Pyrometer’s exclusive ePyroCal Emissivity Calculator. The Pyrolaser® and Pyrofiber® instruments use a patented laser based infrared technology to determine a targets true Emissivity Correct Temperature (Te). Pyrolaser® and Pyrofiber® accomplishes this by automatically measuring the target diffuse reflectivity at the same location temperate and wavelength as the radiance measurement to determine the precise target temperature. While the technology to make non contact infrared temperature measurements has been around for over 100 years, companies still struggle with the guess-a-mating the correct emissivity to make accurate temperature measurements. Some use a nominal value based on published emissivity data that is close to their application, others try to use operating experience and some make a continual science project out of it. In any event, most just set the emissivity to a fixed value and forget it. To accurately measure the True Temperature you must know the target material emissivity which corresponds to the measure radiant temperature. The true material emissivity value is continual changing property (dynamic) based upon many material and application factors during the heat cycle. As with temperature, emissivity is very much dependent upon the wavelength. In order to make an accurate temperature measurement all instrument parameters must be known (wavelength and bandwidth). Very few materials and applications have a fixed emissivity.